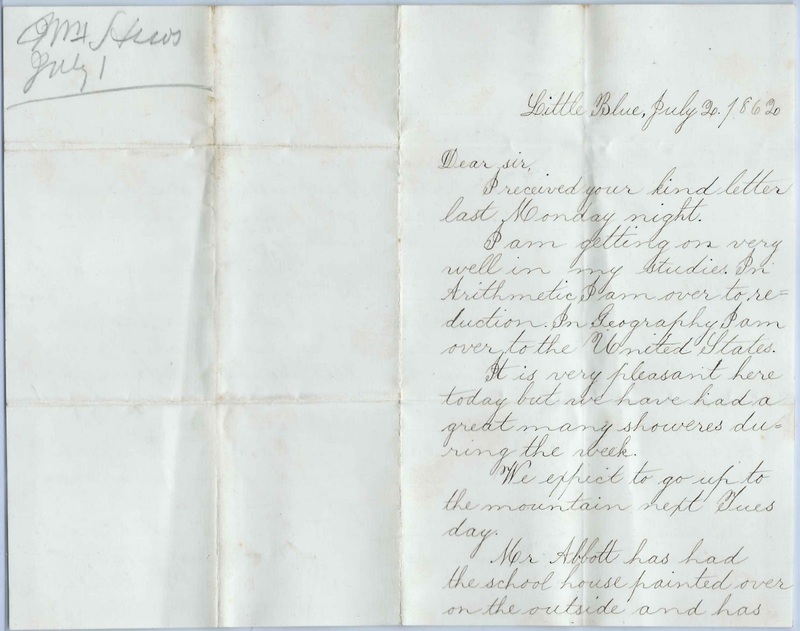 July 2, 1862 letter from W. H. Hewes, a student at the Abbott School, "Little Blue", at Farmington, Maine. 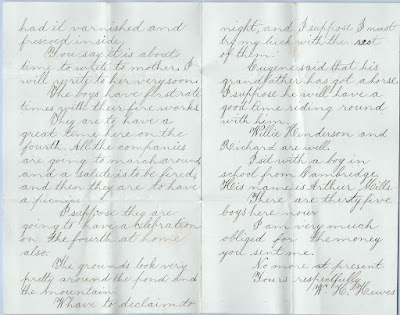 The letter is addressed to "Dear Sir", and could be addressed to his father, his stepfather, his grandfather or some other important man in the family. Sadly, there's no envelope present to identify the recipient definitively. A transcript for the three-page letter appears at the end of this post. The Abbott School was founded at Farmington, Maine, about 1844 by Samuel Phillips Abbott, brother of Jacob Abbot, Jr., author of many books, including the Rollo series. Read more about the Abbott family and the Abbott school here. The Abbott School attracted students from all over Maine and even beyond, so identifying W. H. Hewes is tricky. 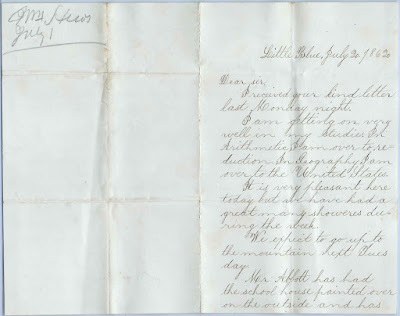 The person from whom I bought the letter indicated he was William H. Hewes, but I don't know if he had personal knowledge or was making a guess. William Hewes of Winthrop, Maine, son of Henry Michael Hewes and Susan (Wheeler) Hewes, who were married in 1845 at Boston, Massachusetts. This William was born in Massachusetts, and it appears that his mother brought him and his sisters to her parents' home at Winthrop, Maine by the time of the 1850 Census. 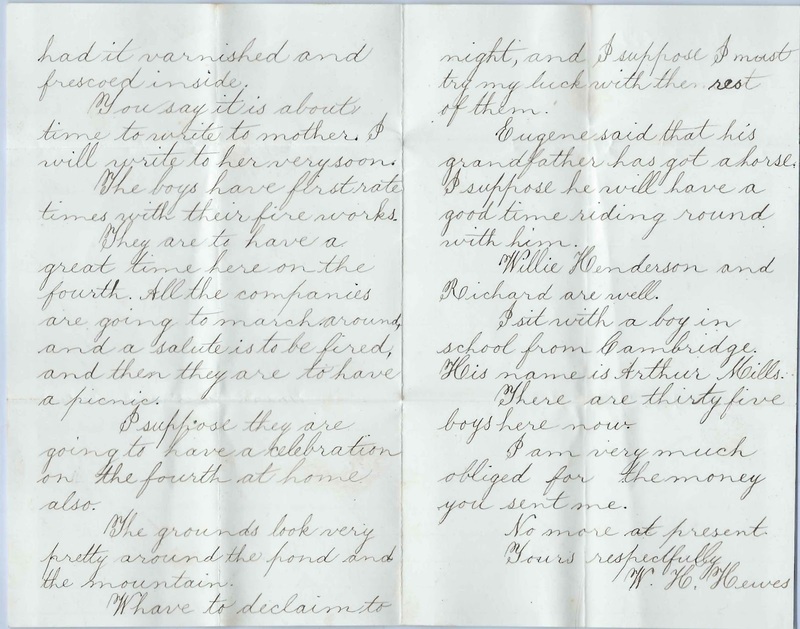 If his father was dead by 1850, W. H. Hewes could have been writing to his grandfather or to a stepfather or ? I sit with a boy in school from Cambridge. His name is Arthur Mills. There was an Arthur Mills from Cambridge, Massachusetts, born about 1851. Where the letter writer didn't mention a state, could this be a clue that the letter writer was also from Massachusetts? I received your kind letter last Monday night. I am getting on very well in my studies. In Arithmetic, I am over to reduction. In Geography, I am over to the United States.\It is very pleasant here today but we have had a great many showers during the week. We expect to go up to the mountain next Tuesday. Mr. Abbott has had the school house painted over on the outside and has had it varnished and frescoed inside. You say it is about time to write to mother. I will write to her very soon. The Boys have first rate times with their fire works. They are to have a great time here on the fourth. All the companies are going to march around and a salute is to be fired, and then they are to have a picnic. I suppose they are going to have a celebration on the fourth at home also.\The grounds look very pretty around the pond and the mountain. We have to declaim to night, and I suppose I must try my luck with the rest of them. Eugene said that his grandfather has got a horse. I suppose he will have a good time riding round with him. Willie Henderson and Richard are well. I sit with a boy in school from Cambridge. His name is Arthur Mills. There are thirty five boys here now. I am very much obliged for the money you sent me.